It’s Time to Come to the Streets Worldwide Again This June. Free All Political Prisoners in Iran! Not One More Execution! The prisons of the Islamic Republic are overflowing with people detained for political reasons. The Islamic Republic is executing people at an apalling rate, most recently Mohammad and Abdollah Fathi, young brothers who were executed because their family members were political activists. Now their mother has been added to the ranks of political prisoners: she was arrested at their funeral. ENOUGH is ENOUGH. It is time to bring people to the street in cities worldwide again to oppose the bloody barbarity of the Islamic Republic regime. OUR humane society DOES NOT TOLERATE this bloodshed in silence! Mission Free Iran supports the call of the Campaign to Free Political Prisoners in Iran to mark June 20 as the Global Day in Support of Political Prisoners in Iran. For those whose names we know. For those who remain unnamed. For those suffering unspeakable tortures in the hell of the Islamic Republic’s prisons. 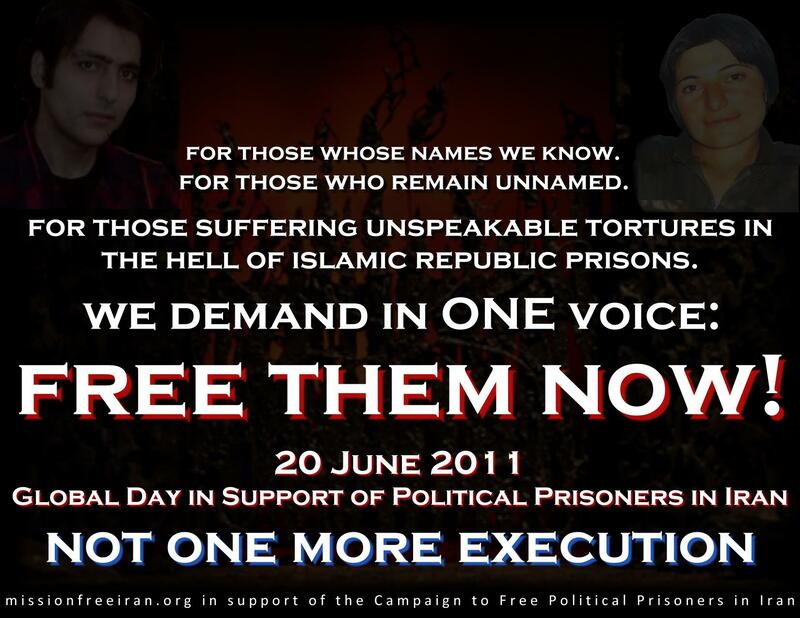 We demand in ONE voice: Immediate and Unconditional Release of All Political Prisoners in Iran! Not One More Execution in Iran! On this page we will maintain a list of cities participating in the June 20 Global Protests. June 20 is a Monday, which is not feasible for many people to hold an action; we encourage everyone to consider holding a demonstration on June 18 or June 19 to support the Global Day. Place: Polytechnic University, Peansioon St.
We shall light candles, to show solidarity; to show we remember. Vi ska tända ljus, att visa solidaritet; att vi minns. Place: Gather at the offices of the Islamic Republic Interests Section (2209 Wisconsin Ave NW) at 1:00 with 1:30 march to Georgetown (M St) to raise awareness of the situation of political prisoners in Iran. You have my full support. Where do I sign up? Our SILENCE is what the criminal regime in Iran is hoping for! Let’s take that hope away from them! Shall we?